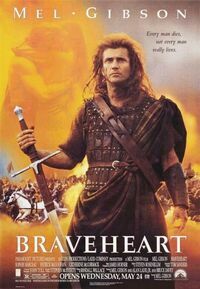 Mel Gibson, Bruce Davey, Alan Ladd Jr.
Braveheart is the lavish Hollywood production of an English occupied Scottish Highlands in the 13th century. Mel Gibson plays the roll of a historical freedom fighter and national hero named William Wallace. The brave Wallace must inspire his people to fight for their freedom against great odds. The film became the most successful film at the Oscars in 1995.